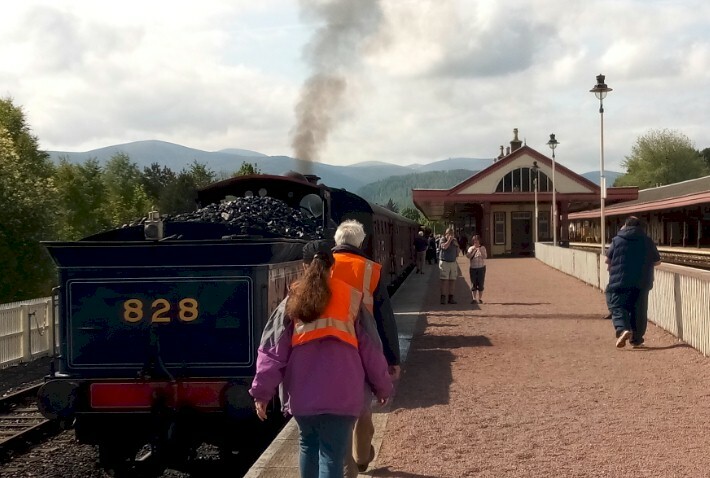 If you are planning a visit to Scotland, one of the “must see” railroads on your list would definitely be the Strathspey Railway, which is based in Aviemore. If this city sounds familiar to you, then you might have read our previous TW articles in this series about the Cairngorm Mountain Funicular (released in November 2018) or ScotRail (released in December 2018). All of these trains are located with-in easy driving distance of Aviemore -- making it a perfect location to spend a few days on your itinerary. Originally opened in 1863, the Strathspey Railway primarily served the timber and distillery industries; unfortunately, it closed to passengers a century later in 1965. That wasn't the end though... part of the line (from Aviemore to Broomhill) was re-opened by the Strathspey Railway Association in 1978. 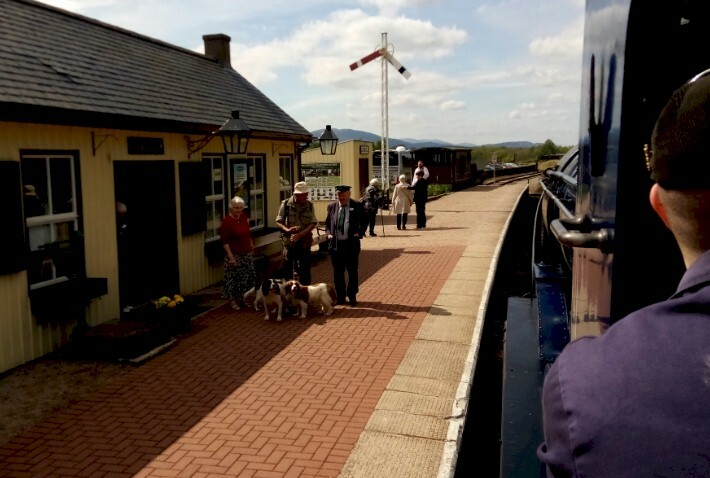 Many of the old stations were restored... and the whole operation now gives an experience of rail travel in the 1950's. The varied countryside with the Cairngorm Mountains as the backdrop provides for an amazing ride all-around. When planning your trip on the Strathspey, note there are departures from Aviemore, Boat of Garten and Broomhill stations. The full 20-mile round-trip journey takes about an-hour-and-a-half. 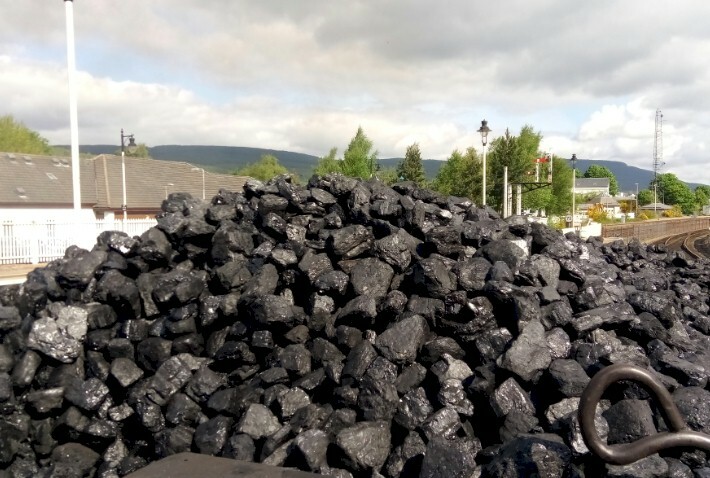 The trains are pulled by a selection of historic steam engines, the oldest of which is a Caledonian Railway Engine, built at the famous Saint Rollox plant in Glasgow. Guided by Paul, we walked a short distance down the tracks in Aviemore to a large locomotive shed that is home to Strathspey Railway's engineering works. While not normally open to the public, Paul and some of the other workers were kind enough to provide us a nearly two-hour-long guided tour of the incredible facility and adjacent railroad yard. 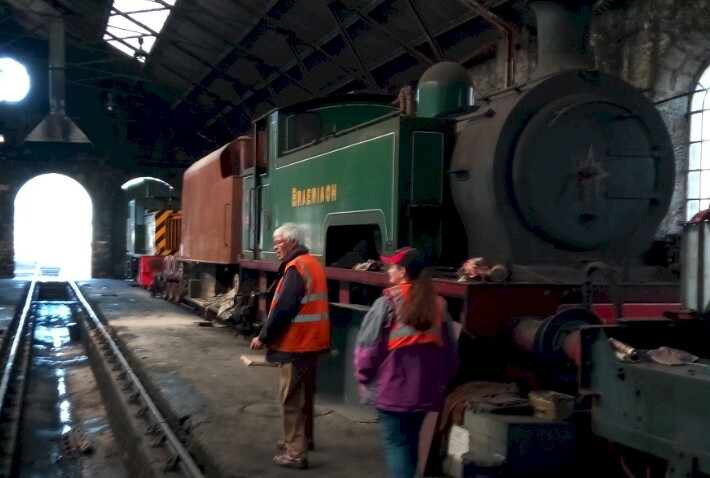 One of the highlights was seeing the four-track locomotive shed built by the Highland Railway in 1898! 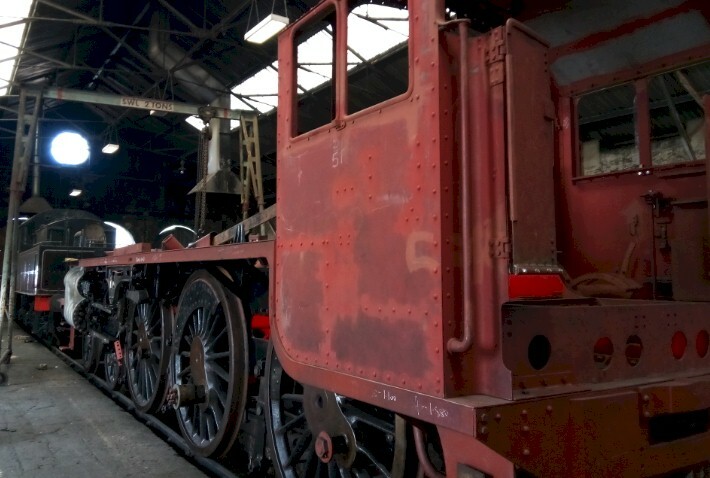 We learned that the original purpose of the shed was to house locomotives for the lines to Perth and Inverness. In the London, Midland and Scottish Railway (LMS) days, it housed Stanier Black Fives, Pickersgill Bogies (Caledonian Railway), Caley 439 tanks, Caley 812 classes, and Fairburn tanks. 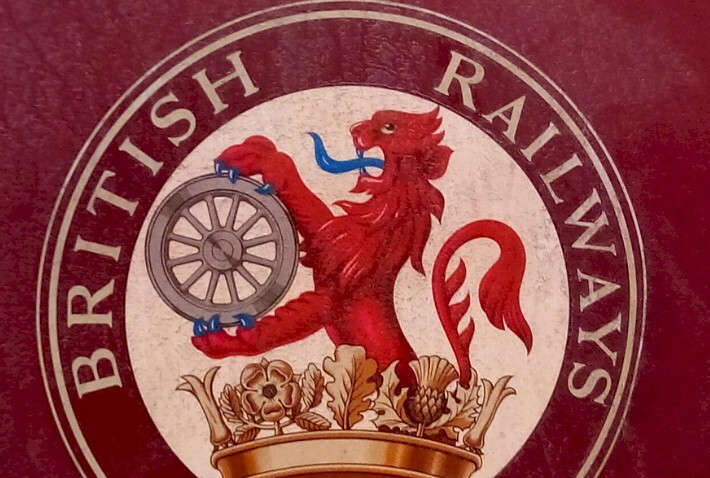 In British Railways days, the shed was allocated the code '60B' (that is why these days the engines that are in traffic on the Strathspey bear the ‘60B’ shed plate on their smokebox). Also located on the Strathspey's Aviemore property is the former enginemens’ hostel called Spey Lodge. This building was erected by the London, Midland, and Scottish Railways (LMS) during World War II to allow railway crews a safe and cheap option for accommodation after they had finished working on their trains for the day. 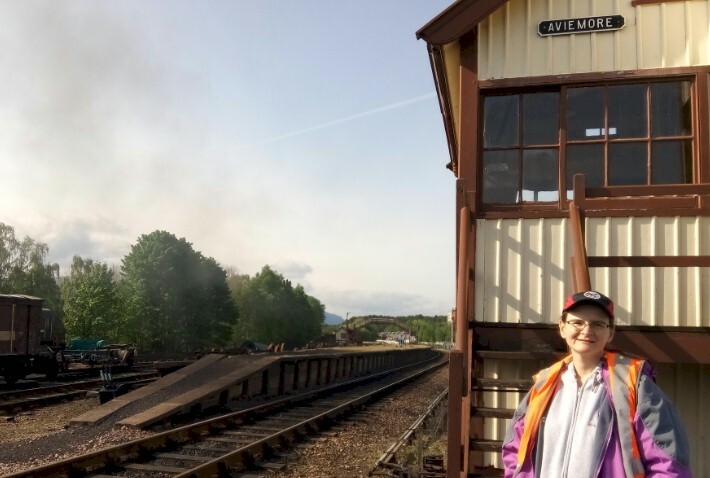 It was saved by the Strathspey Railway Company during the 1970’s and has now reverted to its original use of housing locomotive crews and other railway volunteers. 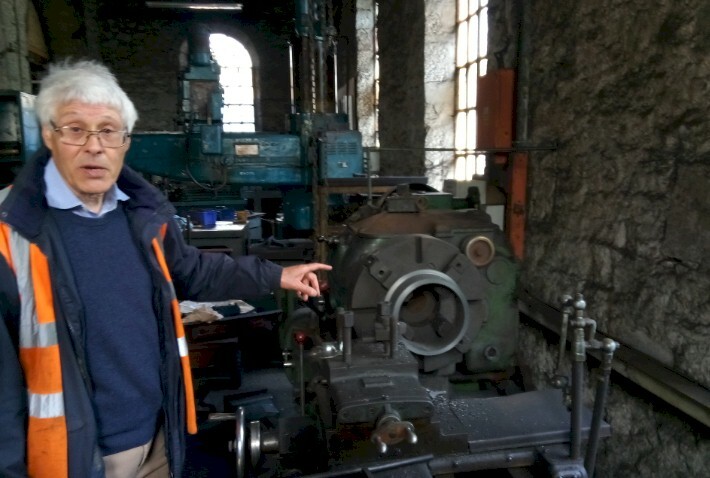 A number of other buildings on the Aviemore property are not necessarily historic, but are important for maintaining the equipment... we took a quick peek in these, too. 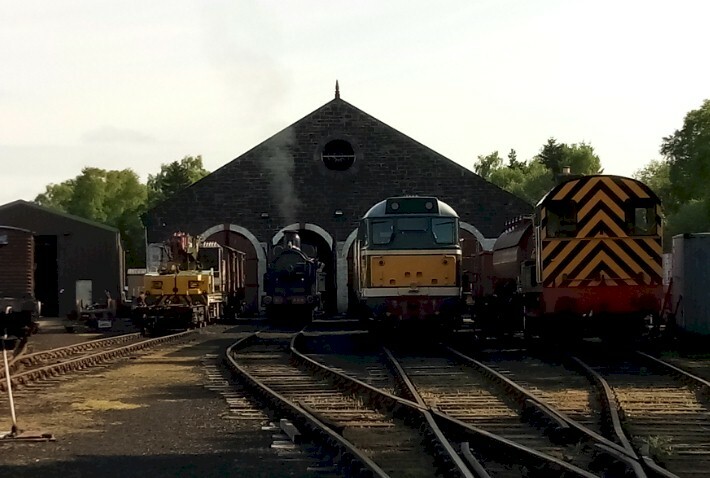 This includes a car maintenance shed which opened for use in 2005; this building allows the railway’s volunteers and staff to work on its fleet of coaches indoors. 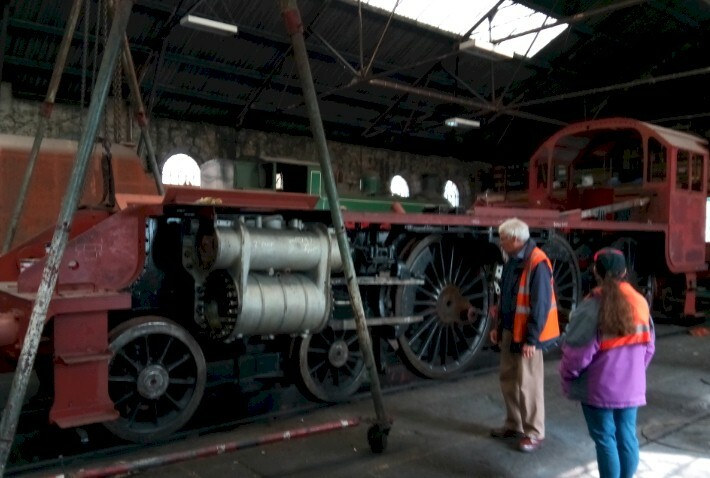 There is also a three track car storage shed that opened in 2011; this allows the coaches to be stored under cover and protected from the weather. 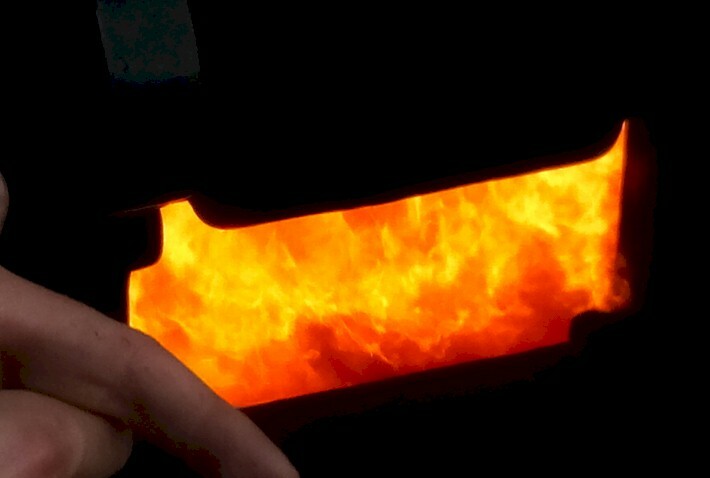 Coaling is carried out using a facility constructed in 2014. 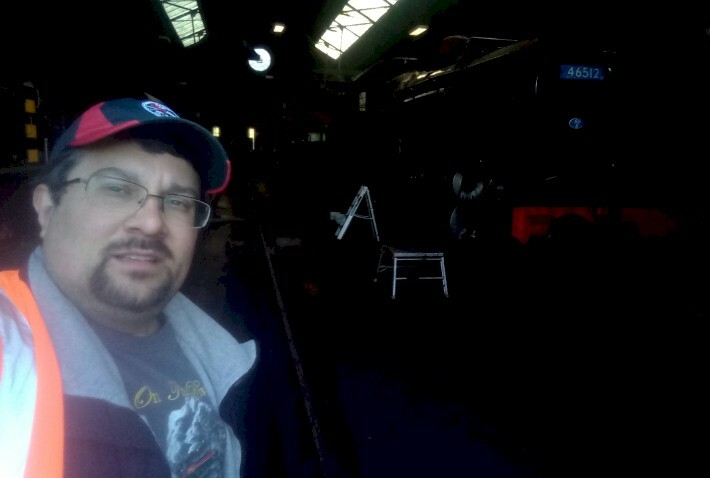 Also on our walking tour, we got to see many of the railways’ historic steam locomotives. 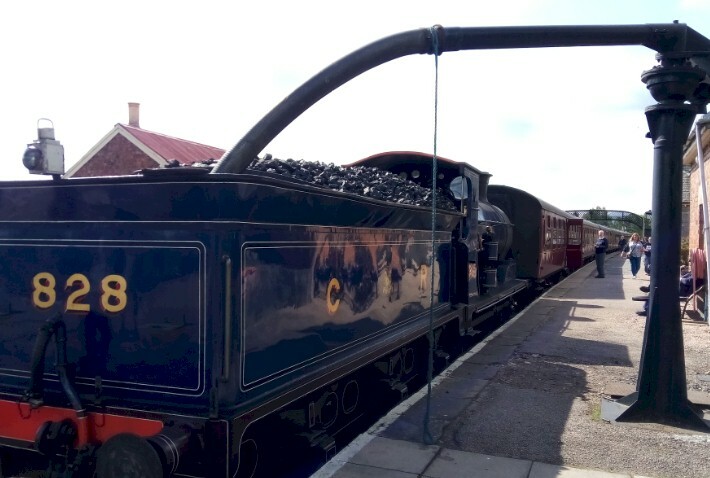 The former Caledonian Railway 0-6-0 was built in 1899 and returned to steam in 2010. 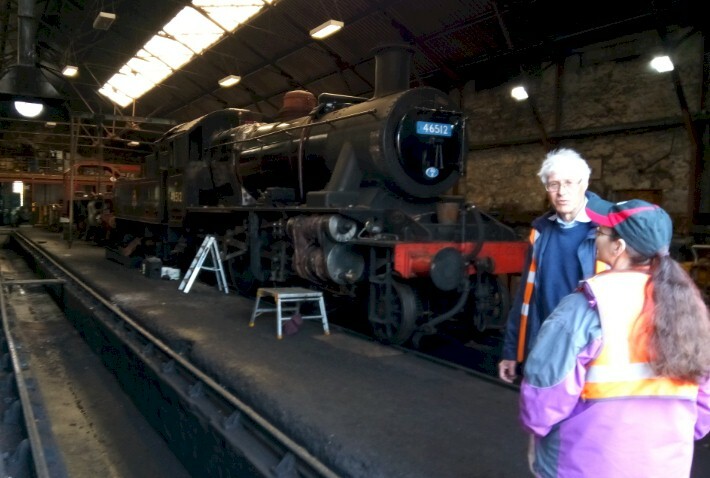 A LMS “Black Five” 4-6-0, the same type which worked most trains in the Scottish Highlands from the 1930’s until steam was taken out of service in the 1960’s, is currently being overhauled. 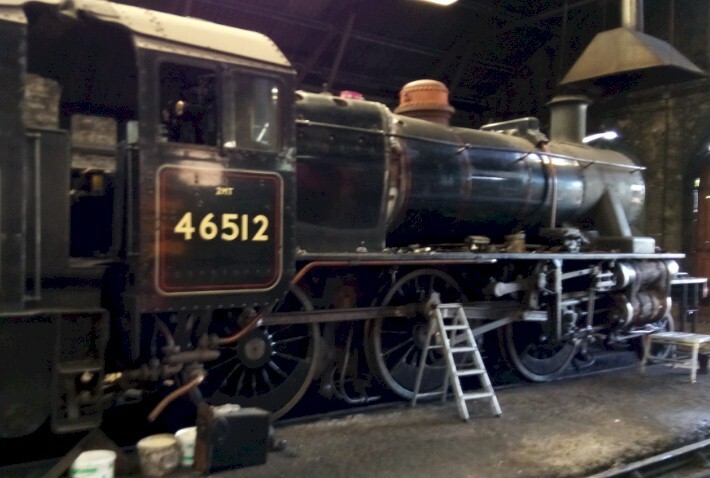 Also on the steam roster was LMS 2-6-0 Class 2MT #46512, which was built in 1952 and returned to steam in March 2011. A Wemyss Private Railway 0-6-0 built in 1935 is currently awaiting overhaul. Three other steam locomotives that are out-of-use are located at the railroad's facility up in the line in Boat of Garten. 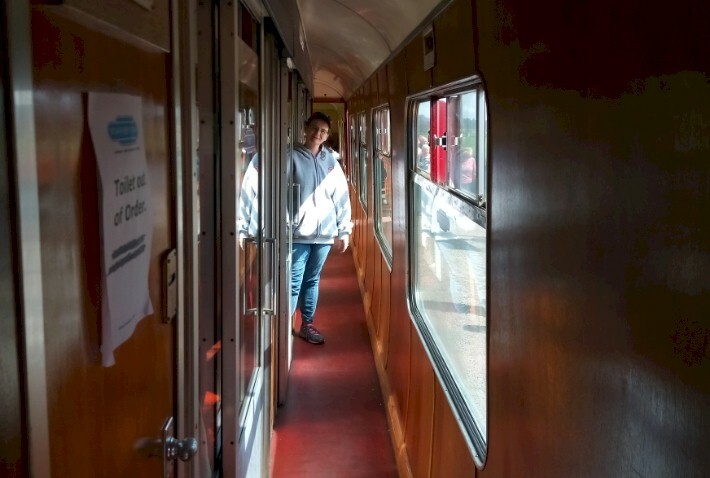 We also got a quick look at the Strathspey's ten diesel locomotives and seven diesel multiple unit cars. It was finally time to head back to the station in Aviemore and begin our ride! 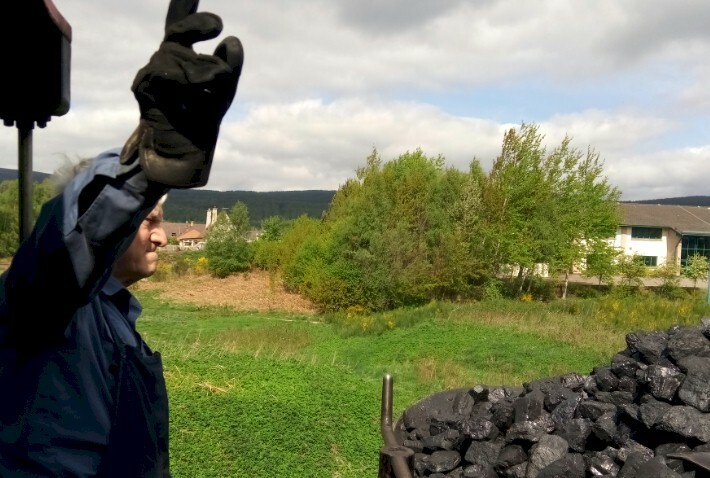 Before saying goodbye, Paul surprised Robert with a 'footplate pass' for the first half of the day's ride... which means he got to ride right behind the engineer and fireman in the cab of the steam locomotive. 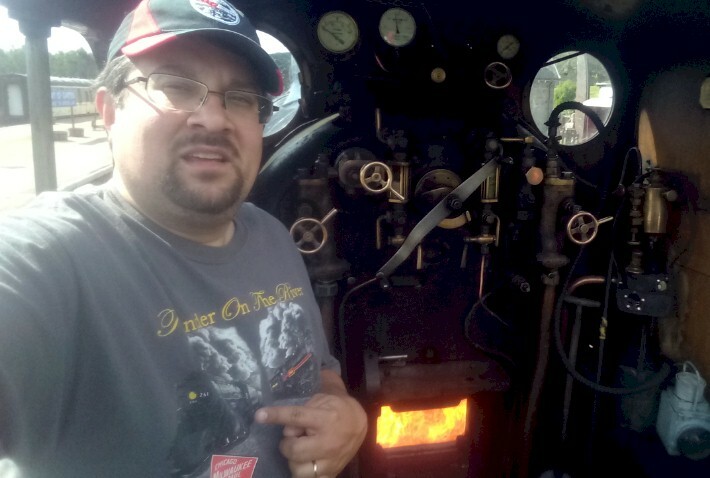 Besides a one-time cab ride on the Milwaukee Road 261 in St. Paul, Minnesota, Robert had never been in the cab of a steam locomotive while it was actually operating. What a special treat! Since there was only room for one person in the cab, Kandace would have her own private six-person compartment to ride in... not too shabby! (Robert would join her in the compartment for the second half of the ride and lunch). 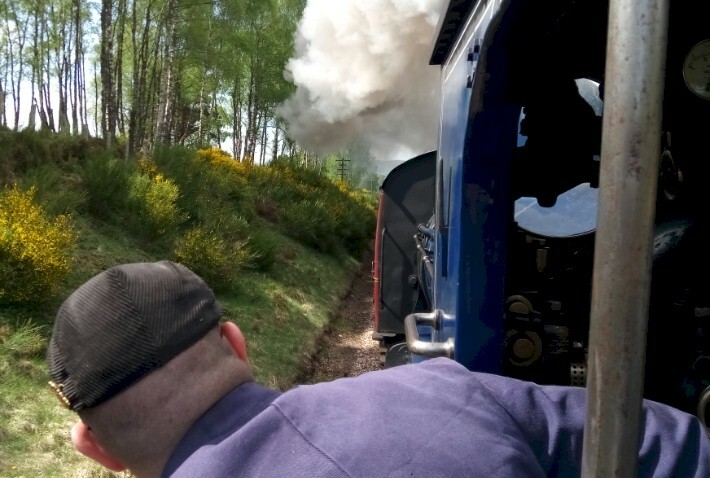 The approximately 10-mile-long line we rode from Aviemore to Boat of Garten was originally part of the Highland Railway’s line from Perth to Forres and features great scenery. Some passengers either got on or off the train at Boat of Garten station... those of us who were continuing on for the full ride to Broomhill also had enough time to get off for about 10 minutes or so and walk the platform and check out the depot, which was built in 1904 by the architect William Roberts. Boat of Garten was originally a parallel junction between the Highland Railway's main line and the Great North of Scotland Railway's (GNSR) branch to Craigellachie. This was the original Strathspey Railway, the company being a subsidiary of the GNSR. Today there are two passenger platforms... while the adjacent yard stores the majority of the Strathspey's out-of-use rolling stock. Boat of Garten also has the railway's only water column where the locomotives stop to take water on their way north through the station (this is the reason why we stopped here for 10 minutes). 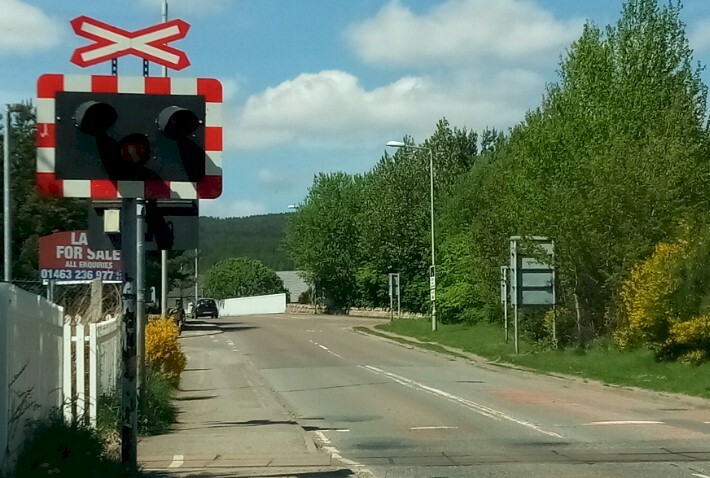 There are two signal boxes here --- Boat of Garten North and Boat of Garten South. 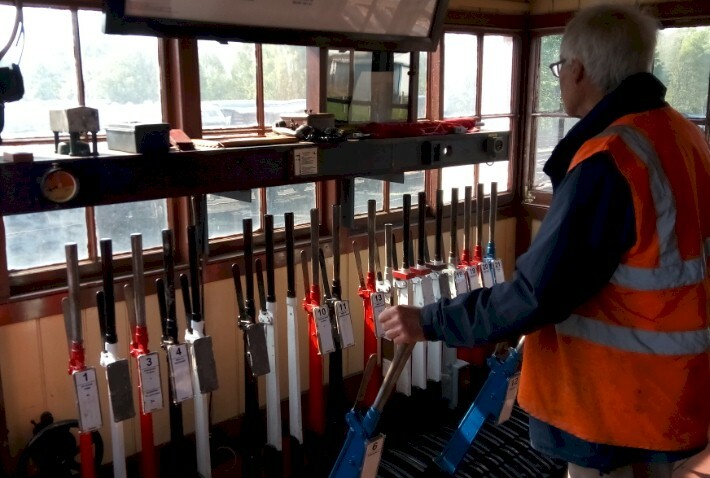 The railway uses traditional British Railways mechanical semaphore signalling; it is the crossing point on the line when there are two trains running. 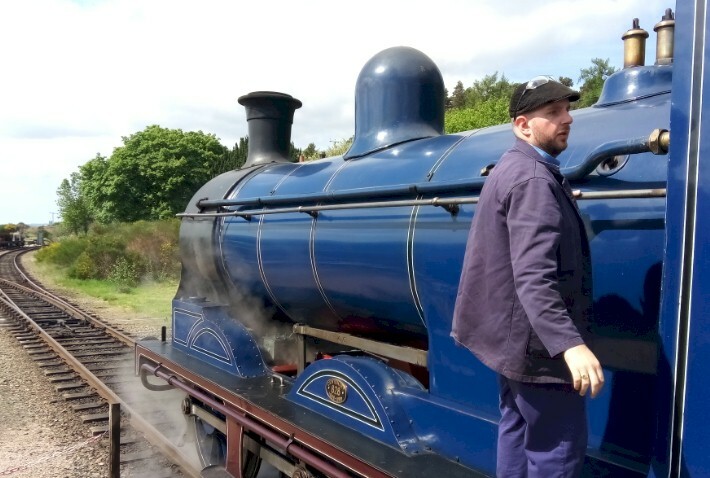 Paul mentioned that most of what visitors to the railway see today at Boat of Garten is original from the days of British Railways. The main layout of the station has not been altered significantly, with the exception of the extensive yard behind the signal box. 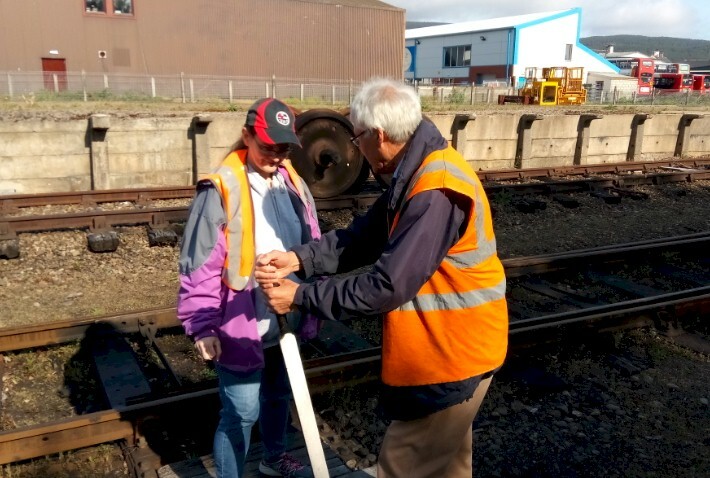 The turnout that formerly allowed access to the yard without having to access the headshunt was removed before the line closed and there are no plans to re-install it. Leaving Boat of Garten, trains cross the road on the new single track box-girder bridge and passes the site of the original GNSR engine shed; long demolished, it is now the site of a permanent way depot. The track had been lifted and structures demolished by British Rail after closure of the line in the 1960's. 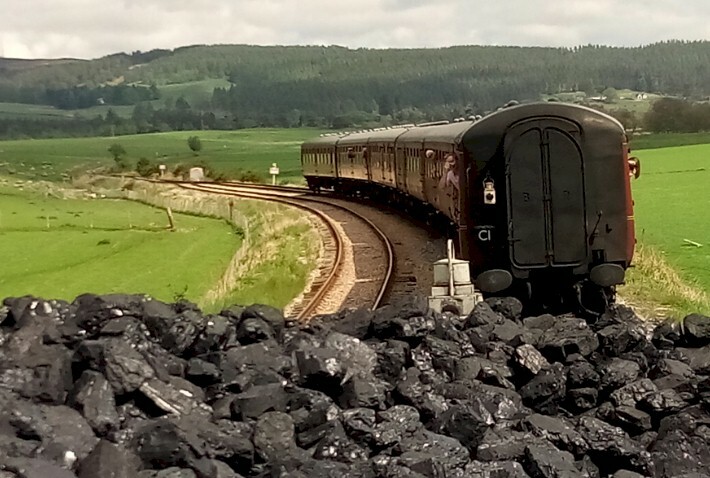 The railway passes though mainly farmland on the re-laid track, which was mostly recovered from Kincardine power station in Fife in the 1990's. The tracks to Craigellachie and Grantown had originally left the station extending in a double track formation as far as Croftnahaven, where the GNSR line turned sharply south east and crossed the River Spey. This arrangement was adopted because a signal box for a junction here was deemed too expensive. The line reaches its current terminus at Broomhill, in countryside roughly halfway between the villages of Nethy Bridge and Dulnain Bridge. The replica station building has been reconstructed on the foundations of the original. The run-round loop is beyond the station. The train stops at Broomhill for about 20 minutes while the engine is switched from one end of the train to the other for the return journey. A small shop is all that is there at Broomhill. Broomhill station is an odd station situated in an isolated rural location, unconnected with any town or village. It was previously a junction (closed in 1965) of two lines. 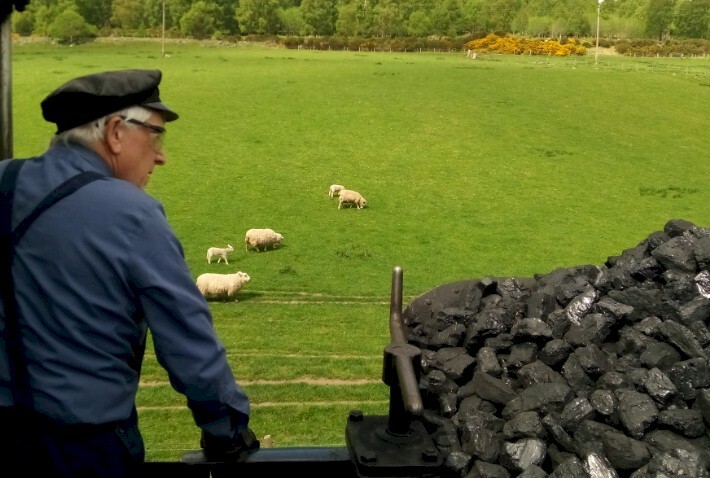 Its claim to fame as the 'Glen Bogle' station in the former BBC TV series, 'Monarch of the Glen'. 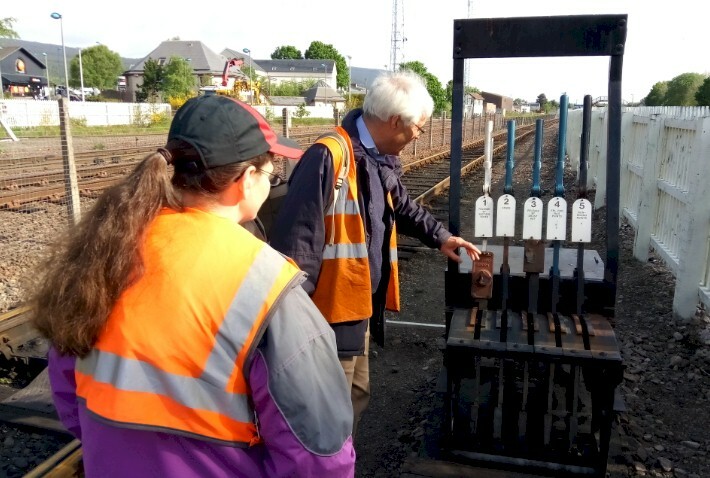 This may not be the end of the line for too much longer, as Paul said that eventually the Strathspey hopes to extend their rides even farther to a location called Grantown. My cab ride ended at Broomhill, and I headed back to join Kandace in our private compartment. 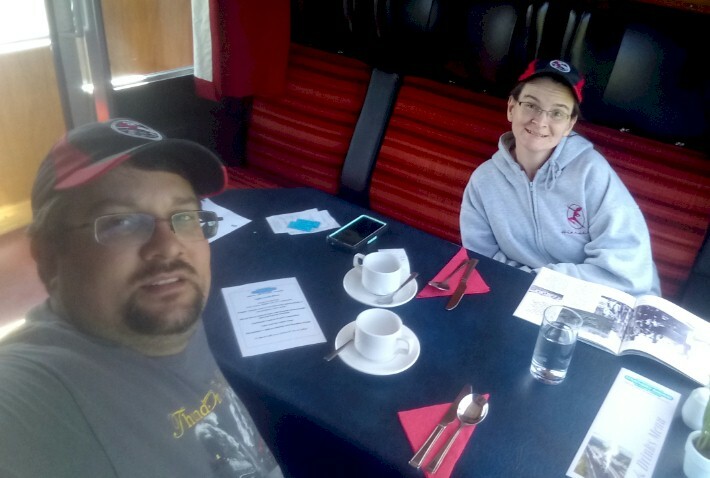 It timed out perfectly because we enjoyed a light lunch on the return trip back to Aviemore. 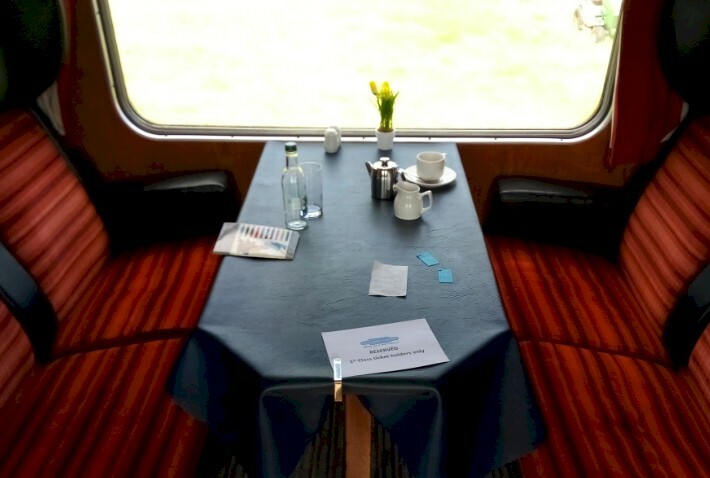 The meal service consisted of a lovely selection of sandwiches and a warm bowl of soup, freshly prepared on board by the catering chef – there was actually a choice of 2 soups, accompanied by a cup of tea or coffee. Before we knew it -- we were back in Aviemore and it was time to hit the road to Fort William -- for our final train ride of the trip -- the Jacobite!